LOS ANGELES–(BUSINESS WIRE)–Today the Los Angeles Kings and the NHL are strengthening their presence in China and expanding their relationship with ORG Packaging, a packaging and containers company based in Beijing, with the launch of Beijing Jr. Kings. The agreement, brokered by AEG Global Partnerships, makes the Beijing Jr. Kings the first-ever youth hockey development program created (jointly created with ORG Packaging), owned and operated by the LA Kings outside Los Angeles and the first-ever development initiative for any NHL team in China. The program will be housed at the new Beijing A.Z. Ice Sports Club and former Kings forward Todd Elik serves as head coach. One year ago, the Kings and Vancouver Canucks played the first NHL games in China. Facing off for two preseason games, presented by ORG Packaging, in China – one at Mercedes-Benz Arena in Shanghai (September 21, 2017) and one at Wukesong Arena in Beijing (September 23, 2017) – the Kings won both games and history was made. In conjunction with the 2018 China games, the Kings, the NHL and ORG Packaging will continue to build an infrastructure and a presence for hockey in the world’s most populous country through this strategic investment in China’s youth with the Beijing Jr. Kings development program. “Coming off the success of our trip to China last year, and the numerous clinics and camps we have hosted in China over the years, this is a tremendous announcement for the LA Kings and we are very pleased to not only continue our relationship with ORG but to also expand our relationship with ORG in a very meaningful way,” said Kings President and Hockey Hall of Famer Luc Robitaille. Elik is a former NHL player with 24 years of professional hockey experience – eight years as a forward in the NHL (including two seasons with the Kings from 1989-91 where he scored as many as 21 goals in a season). He has more than 10 years of coaching experience working with a range of ages and skill levels both in Canada and Switzerland. His experience over the years is as follows: Assistant Coach Regina Capitals Junior B; Head Coach HC St. Imier 1st League Switzerland; Head Coach HC St. Imier Junior Team; Assistant Coach Regina Bantam AA Blues; Head Coach Regina Pee Wee Avalanche; and Assistant Coach University of Regina Men’s Hockey Team. Serving as the Beijing Jr. Kings goalie coach is Mitch O’Keefe. O’Keefe has spent the last year and a half coaching and evaluating youth hockey for the Black Armour Hockey Program in Beijing where he was Assistant Coach as well as Head Goalie Coach. In addition, O’Keefe brings to the new program his extensive pro hockey experience in Switzerland, Italy, France and Canada along with a well-rounded and diverse set of coaching skills, which include power skating, goaltending, game analysis, and coaching with positivity. The Kings will support the Beijing Jr. Kings by sending Kings players – current and alumni – to China each year to help teach kids the basics of hockey and to help generate excitement and awareness about the sport on the whole. The Kings will also be heavily involved by: Hosting Coaches Training Programs, Player Exchange Programs, Youth Hockey Clinic, Official LA Kings Prospect Camp, Prospect Development Camp, Tryout Opportunities, Player Development Support and International Tournament Development Opportunities. Registration for the Beijing Jr. Kings has begun. The program is initially expected to have two-to-three teams. The age range for Beijing Jr. Kings participants at this time is eight-to-10 years old. 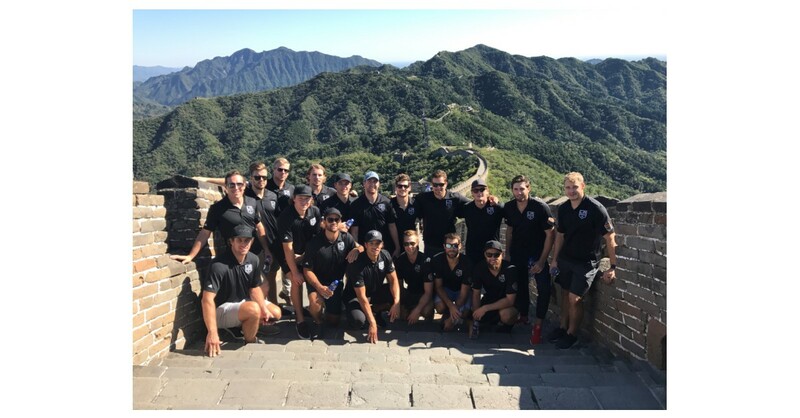 In recent years, the Kings have traveled to China the past three summers and have worked with youth hockey officials, coaches and kids to help grow the game in a country that has had limited exposure to ice hockey. The Kings Hockey Development department has spearheaded these initiatives in conjunction with the Kings Alumni Association. Also, in recent years, kids from China have traveled to Los Angeles to participate in the annual Kings Youth Hockey Camp in El Segundo, CA. The kids from China also participated in scrimmages here against members of the Jr. Kings program. When the Kings went to China last year, the hockey club placed a heavy emphasis on current players interacting with kids and young hockey players in particular, including several on-ice clinics, player appearances and meet-and-greets. The Kings also during the 2017-18 NHL regular season hosted the club’s first Chinese Heritage Night at STAPLES Center and the Kings will host their second annual Chinese Heritage Night in February. The NHL remains active in China with the Beijing Jr. Kings taking part in a variety of promotional events. Elik earlier this month represented the Beijing Jr. Kings for “Stanley Cup Day in Beijing” as the Stanley Cup was on-site for various hockey groups – including skaters, youth players and kids completely new to hockey – to have the opportunity to view the most famous trophy in sports. Elik is also scheduled to be a featured participant at an NHL Coaching Clinic on September 17 on behalf of the Beijing Jr. Kings. The event ties-in to the NHL’s two preseason games in China this month between the Boston Bruins and the Calgary Flames.